Hong Kong and Macau are surrounded by the sea. And we all know that Life is beautiful under the sea. 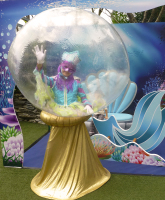 There can be pretty mermaids and enigmatic sea pearls in their inflated bubble. More characters could be imagined on this theme. Just let us know what you need.